DARK FUNERAL are without a doubt one of the most notorious and highly regarded acts of the Black Metal genre. They epitomize the dark essence that is and always will be at the true heart of the European scene. Lord Ahriman continues to wave the flag of Swedish Black Metal with the Dark Funeral crusade. Where many would have, and do fail, Ahriman and Dark Funeral continue to prevail. IMMOLATION has been an innovative and uncompromising force in the extreme death/black metal underground scene for over 30 years. With a dark approach to the enormously heavy genre they revel in, IMMOLATION return to Australia to crush all to dust! 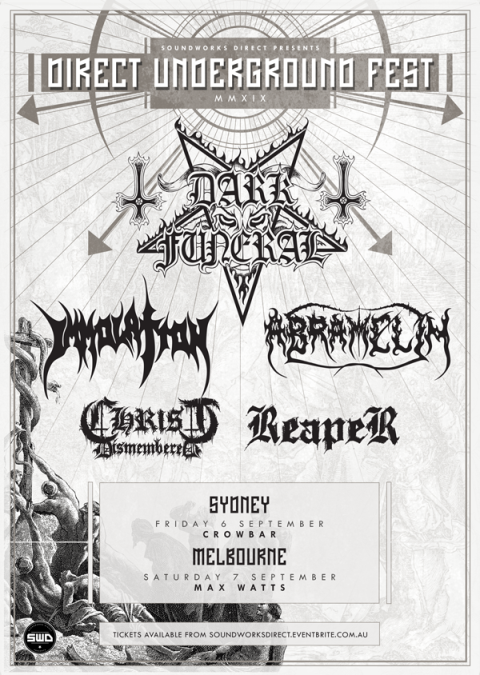 ABRAMELIN are arguably the pioneers of death metal in Australia having released two of the most intense and savage recordings in our heavy metal history in ‘Transgression From Archeron’ (1994) and the self titled ‘Abramelin’ (1995). Expect no mercy. CHRIST DISMEMBERED hail from the darkest corners of South Australia. Their intense brand of blackened filth mixed with a chaotic and atmospheric live performance continues to shock and stun audiences and they only grow more fierce as time progresses. REAPER are maniacs from Melbourne discharging an uncompromising, raw & dirty thrash / black metal attack!